We first met Phil Lewin at the Inspiring Leadership Conference in 2015. 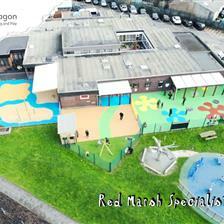 He said we had been recommended to him from another school which is actually no surprise to us due to the fact that 65% of our playground developments come from referrals and returning customers. He wanted to add something exciting to his playground that would bring children together and inspire a healthy and active lifestyle. 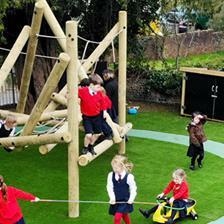 Ideally, Phil wanted this new playground development to encourage teamwork and safe risk taking to further develop their gross motor skills and cooperation. Our owner and Founder, Andy Snell, knew a Trim Trail would be the ideal play solution and due to our openness to bespoke work, we even let Phil create his own Bespoke Trail with challenges he hand picked for his children to enjoy. Trim Trails are great for friendly competitive play, for instance, children could host their own races to see who can get to the other side in the quickest time. Pretend and imaginative play will also come to life as children pretend they are swinging above water or across trees in the jungle. "After meeting at the Inspiring Leaders Conference, I was recommended to you by a fellow head. The process seemed clear and simple and we could clearly see the progression of the project which from a Head's view, is key and crucial as it would save me some time". "The work was quick and efficient from everyone involved from the consultants to the installers. 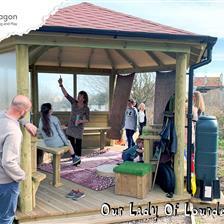 The design plans were all brilliant and they were great for getting the children excited". If you are interested in having your very own Bespoke Trim Trail, please feel free to Contact Us to book a free consultation... it's time to transform your playground like Ibstock Primary School.